We finally did it! My husband and I bought our first home. We’ve moved 8 times in 10 years, thanks to the Navy, and we’re definitely not “here for good” in Virginia Beach, VA (though I’d LOVE to be here forever), but we were so tired of renting. This isn’t a post about the home-buying progress, so I won’t go further into it, but if you have lots of questions, I may later on. We love our house! It’s a sweet 2-story 4 bedroom home. The kids are beyond thrilled that there are STAIRS. The flooring in the entire downstairs is gorgeous, and the natural light is fantastic. And while it’s been updated quite a bit aesthetically, there’s still a lot that we’d like to tweak. We’ve already installed and moved some electrical outlets, and installed overhead lighting in the 3 non-master bedrooms, which had no overhead wiring before. Those weren’t DIY jobs – I hired a fantastic electrician to do those. And now, we’re moving on to the kitchen. 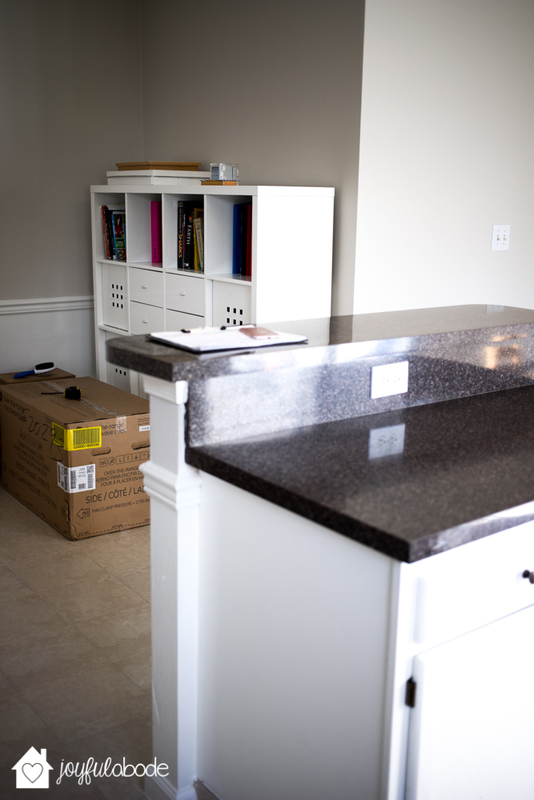 If this were our “forever home,” We’d likely be pulling out the cabinets and starting from scratch. But since we’ll just be here for a few years, we’re going to do a much more “mini” remodel in here. I still think it’s going to have a HUGE impact! The first thing we’re changing is to switch all of the hinges out for white ones. It’ll help to get rid of some of the visual clutter the dark hinges create right now, but without the complication of having to switch hinge style completely (and drill all new holes) for hidden hinges. 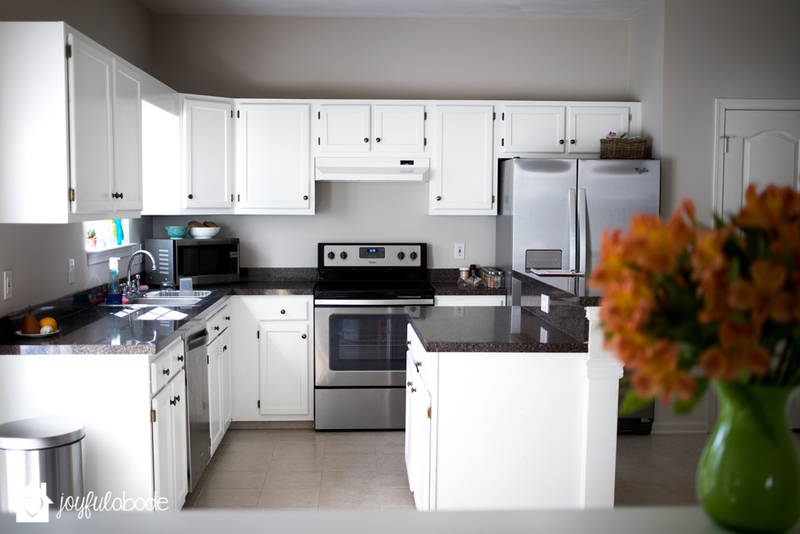 My favorite kitchen of ours so far was our Maryland kitchen. Sure, it was huge and that part was awesome, but a big reason we loved it so much was the counter-height seating area. The kids joined me there every day, eating breakfast or doing crafts, using watercolors, working on a “school” project or experiment, and helping me cook. Well, in this house, we have the “bar height” step-up, and it drives me crazy. It’s too high for the kids, even on barstools, and the high counter portion is so narrow, it wouldn’t really work well for experiments or art, or for sliding bowls back and forth for helping me stir, measure, and cook. 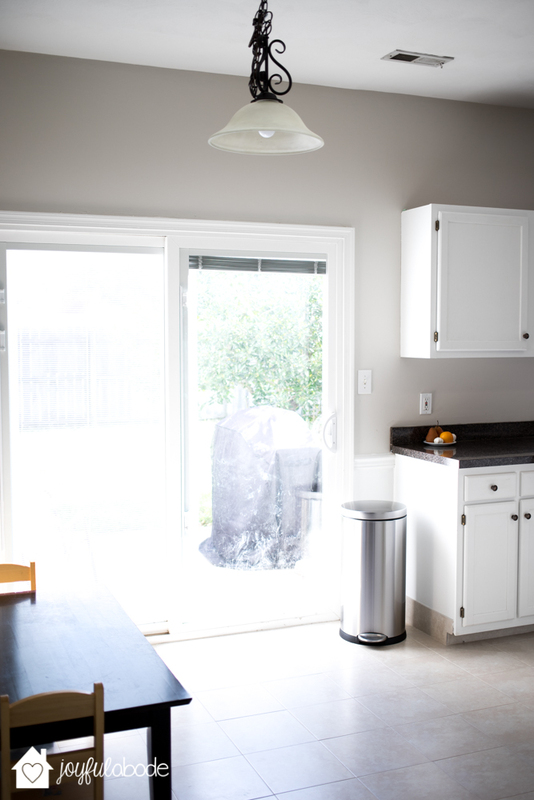 When I come in from grocery shopping, it’s not convenient to sit the bags of food on the counter, since the high part is narrow, so having it all counter-height will be useful for that too. Currently, I walk around the island to put the groceries on the lower portion, and then the bar height section gets in the way while I’m trying to move things into the fridge. Sooooo… we are going to hack it off!!! It’s such a SMALL thing, but it will make everyday life and using our kitchen FAR more pleasant in countless little ways. I cannot wait to have my kids at the counter with me as we work! We basically decided not to invest a lot of money in our counters. 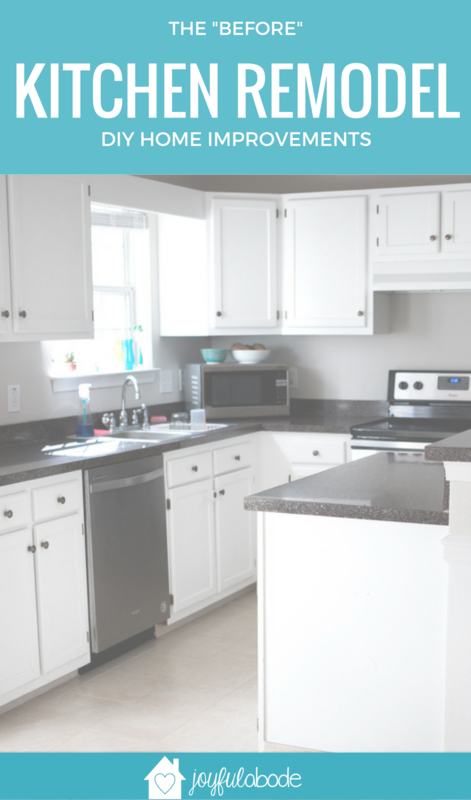 Because we feel like if we replaced them with something SUPER nice (like quartz) we would basically have to also replace the cabinets. 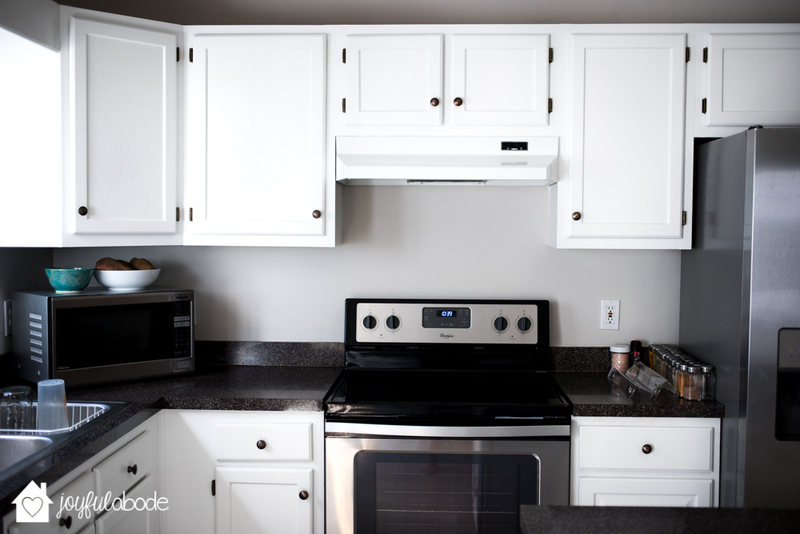 Quartz deserves new cabinets. 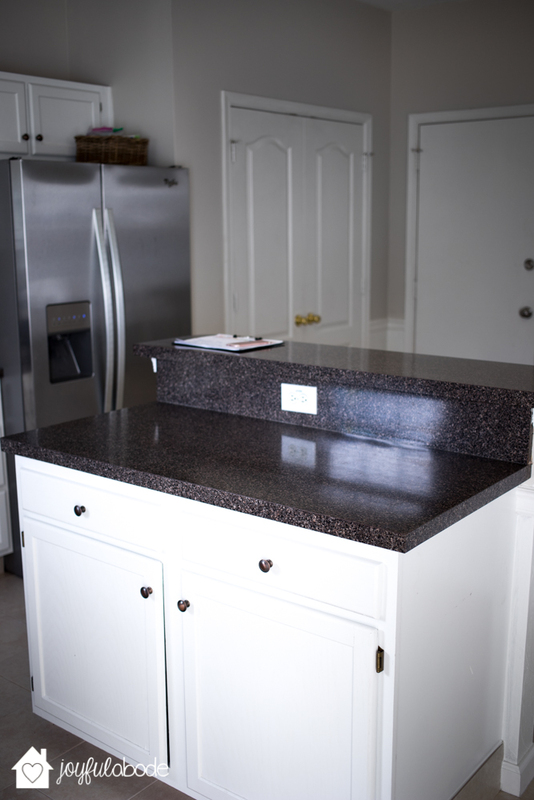 So we were going to find the same Formica/laminate countertop and just replace the island piece with a deeper one. Again, all counter-height, but still with an overhang for a seating area. But they don’t make pieces deep enough. So we need a new countertop. 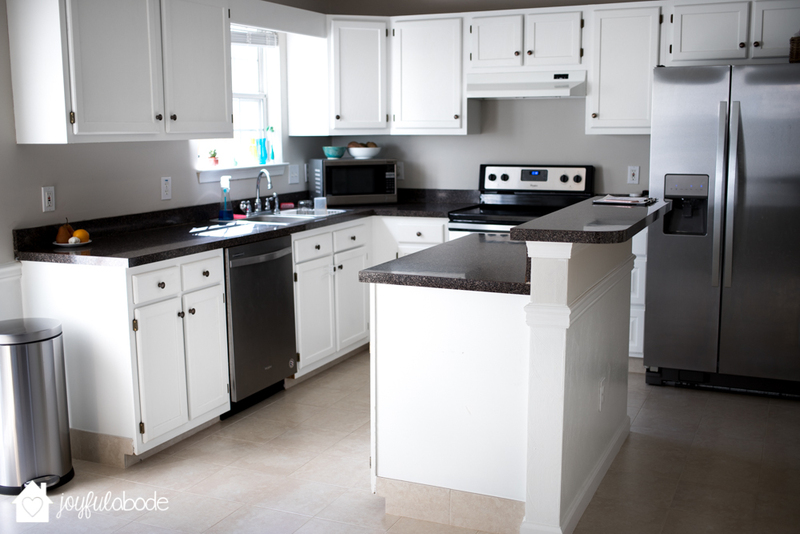 After doing some research on it, we decided that butcher block counters are for us! And we decided to go all out, replacing ALL of the laminate with DIY-sealed butcher block. It’s going to be bright and light and glorious. But then… we may as well replace the sink, right? While we’re taking out the counters? We both hate this kitchen sink. It’s too shallow. Washing dishes (well, mostly bigger stuff like pots and cookie sheets) has been uncomfortable here to say the least. It LOOKS like a normal sink, but it FEELS much smaller than any other sinks we’ve had. I love the look of apron front / farmhouse kitchen sinks, but they’re quite expensive. So I think we’ve settled on an under counter mount style, with a single basin. 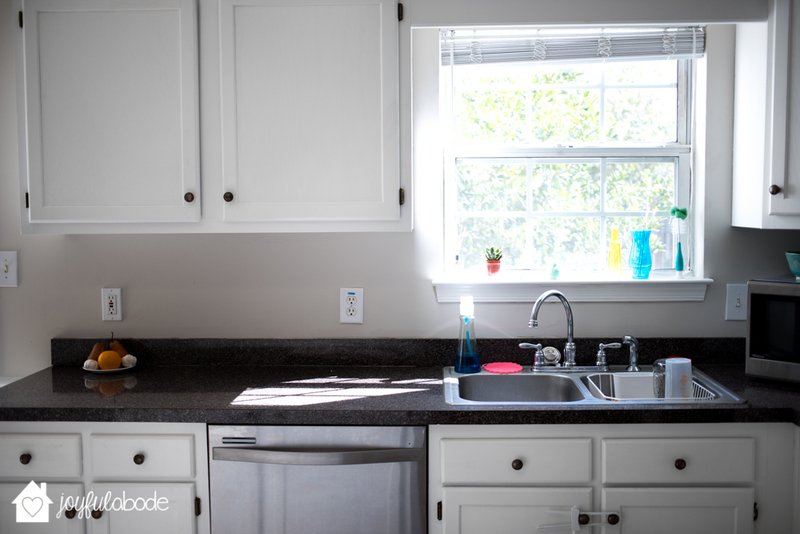 We’ll be getting a single hole faucet deal with the pull-down sprayer… easier to clean around than multiple knobs and sprayer and such all poking out from the sink / counter, and a sleeker look. I’m also super psyched that my husband agreed to install a white subway tile backsplash. I LOVE the look of it, and it’s going to make everything seem fresher and more modern! Also, see how microwave takes up that entire corner? I am excited to reclaim that space! We got a range hood microwave which will replace our current microwave AND our original-to-the-house, not super-functioning current range hood. SO excited! I love clear counters. They’re my favorite. So having that UP will be so refreshing. And see our spices on the right side of this picture? I bought clear acrylic wall mount spice racks and have been trying to figure out how to get them to stick to the fridge so I can put the spices there. I got regular magnets, then SUPER STRONG magnets, but neither was good enough. Suddenly it dawned on me… I’ll just use those awesome 3M adhesive strips to attach the spice racks to the fridge. OFF the counter! As soon as I realized we didn’t have enough drawer space to store my spices in one, I got beautiful new spice jars which came with awesome labels for the tops. I cannot wait to have them beautifully and conveniently displayed right near where I use them, AND off the counter tops! 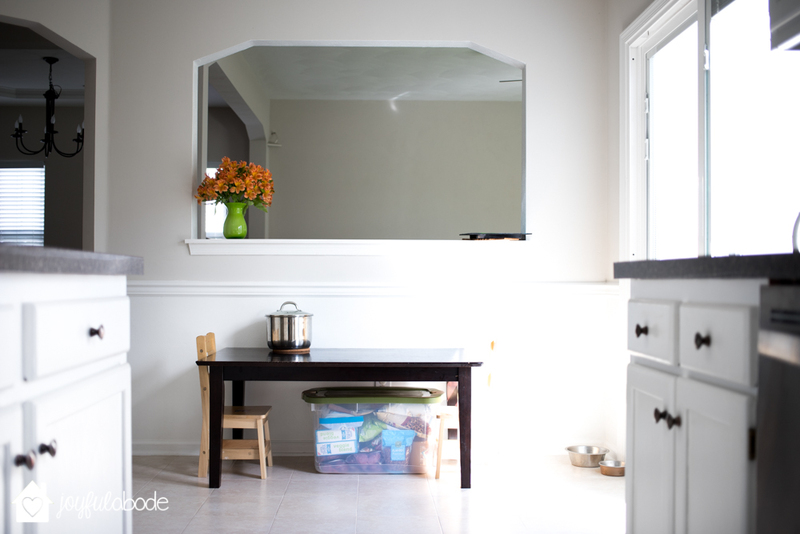 Just so you know what the other side of the kitchen looks like, this is the “eat in” area, where I’ve put the kids’ table and chairs. For now, we have our hurricane food underneath it but that’s ugly and temporary. The pot on top is some in-progress yogurt we’re making, and Zora’s bowls and the door to the backyard are to the right. Looking through the cutout, you’re seeing kind of an empty area between the living room and dining room. It’s part of the living room, but we don’t have anything there right now besides Zora’s bed. It’s a great place for the kids to build with their train tracks behind the couch! 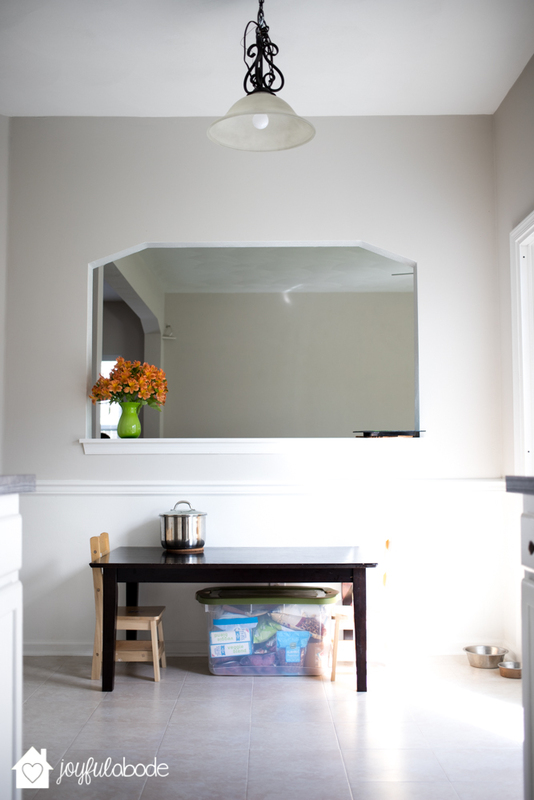 I’m not in love with this light above the area, but I’m not sure what we’d replace it with… I’m open to ideas! There’s also an industrial-looking fluorescent light in the kitchen too. It’s not cute, but it works and it’s out of the way. Eventually, we might like to extend our concrete patio or lay one out of pavers or bricks or something… it would be nice to not have to look at the giant cloaked grill right outside the door. And we currently only have folding beach chairs out there, too. Kind of on the hunt for some cute, comfy, but low-profile patio furniture. And excuse Zora’s nose-prints on the door, please. So that’s our new kitchen, in its current state. What do you think? Would you leave it as-is or do our changes sound good to you? I cannot wait to see the final look of our “mini” remodel! 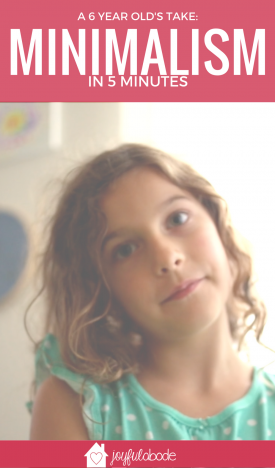 Minimalism - Here's what my 6 year old wants you to know. Her thoughts on minimalism, decluttering, passing clutter on to loved ones, and living in the present. This is a great at-home Montessori practical life work for toddlers, starting around 16-18 months, through around 2.5 years old. 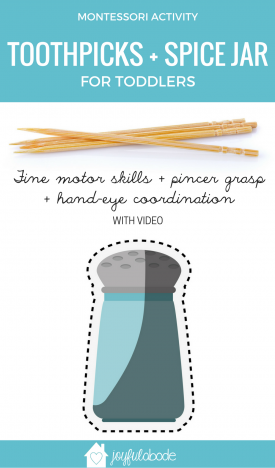 All you need is an empty spice jar, toothpicks, and your toddler for this activity. Click to watch the video! Need inspiration and ideas for how to display your photos and memories? 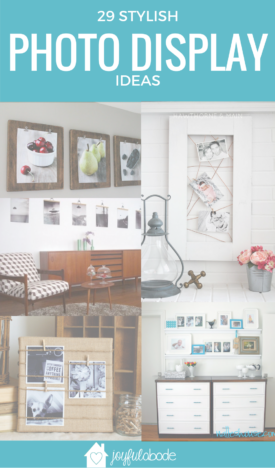 These 29 photo display ideas and tips will have your walls gorgeously decorated in no time! 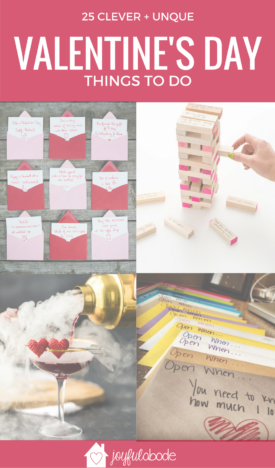 Things To Do For Valentines Day that are super fun and clever! Ideas for everyone, from little kids to married couples. This list is inspired by showing love to your family and those around you each day! Valentine Boxes are tons of fun when you make them yourself. 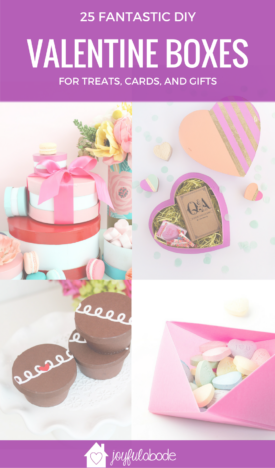 Check out the best DIY Valentine Boxes - with printable templates, tutorials, and instructions. Why did I cut my hair? Did you Miss the 2016 ABC Kids Expo? Here’s what you need to know.